Don Kendrick, mayor of LaVerne, Calif. (right), presents Roy Halberg, pastor of Grace Fellowship of Alta Loma, Calif., with the Pride of LaVerne award. 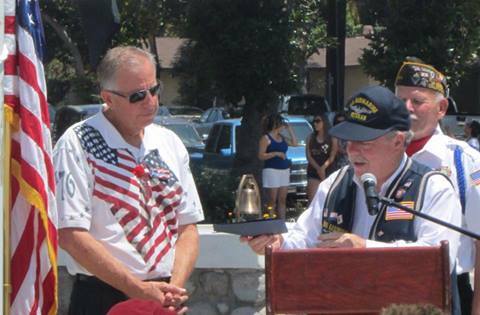 Grace Brethren pastor, Roy Halberg, was honored on Monday with the Pride of LaVerne Award. Presented during the Memorial Day service in LaVerne, Calif., he was recognized in appreciation for serving as chaplain for the city of LaVerne’s Memorial Day and Veterans Day services. He and his wife, Andrea, live in LaVerne. He is pastor of Grace Fellowship of Alta Loma, Calif.
Hey-Hey-Hey! Way to go Roy! Proud to know you and delighted for you as you rece3ive this award.